As much as I hate to admit being wrong I am going to take my medicine and admit that I was wrong about Google Plus. Very wrong. This article is going to relate golf to Google Plus. Just bear with me. When deciding upon a country club membership most golfers try to get past the hacking stage before dropping a check for $10,000 to $125,000 as an initiation fee. This does not include the $400 monthly dues. Don’t get me wrong, there are still plenty of chunkers on the fairways of country clubs every weekend but they are still capable of getting around a golf course. I guess what I am trying to say is that most golfers with a country club membership do not need to be told how to play golf. They may take lessons to get better but they are not going to start from scratch with an expensive country club membership. When a social media product or service is created the users decide how to, well, use it, right? Unfortunately, this was not the case with Google Plus. 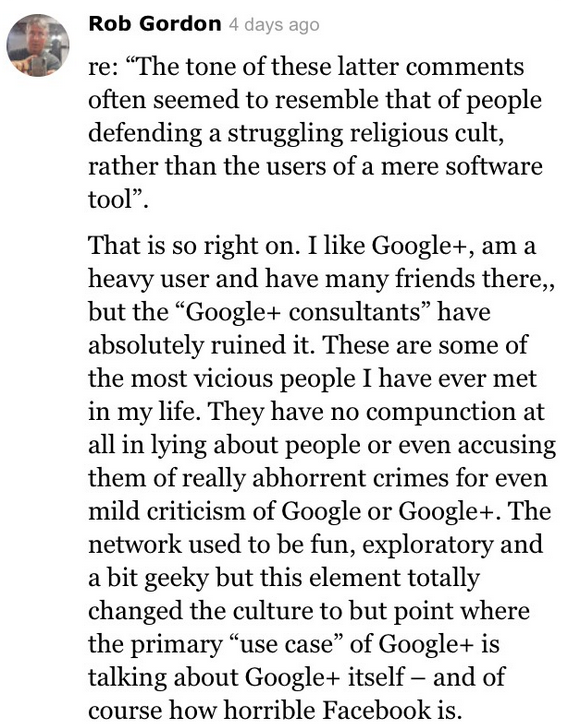 Some of those that were very active on Google Plus felt it was their right to tell others how to use the product. There were expert classes, academies in which you could “level up” and private communities for the gurus. Admittedly, I was caught up in this for a very brief period of time but my eyes opened quickly. There is no right or wrong way to use social media. Do whatever you want to do! The same holds true for the golf swing. I have seen some of the most ridiculous golf swings work me up and down the golf course. In fact, I would say I have one of the worst swings you will ever see but I am willing to challenge you to 18 holes on any Tom Fazio course in the United States. I get my 12 strokes for my handicap though! When I step up to the first tee on any golf course, especially at my country club, the last thing on my mind is telling someone how to hit the golf ball. Even if they hit a snap hook into Ron’s house or slice one into the practice short game area it is not my right to tell them to start adjusting. In fact, I will bring up everything but their swing. I will ask them what they do, where they live or the last great movie they watched. The conversation could range from the fantastic cheeseburgers at the turn house to the downfall of Tiger Woods. The only way I will ever offer swing thoughts or analysis is if they ask for it. Even if they ask for it I will remain very brief and do my best to help them enjoy a fantastic day on the golf course. Live is hard, why not make golf enjoyable. I could say the same for social media. Unless someone comes to you asking for advice why are you offering user guides, how to’s and the best ways to get engagement? When Google Plus started to see a significant drop in usage it happened to be the peak of “help” guides being shared by the “power users”. This is when I walked away. No, I sprinted. I have no interest in being told how to be social. We are naturally social beings. Why on earth would I allow someone I have never met tell me how to engage and interact with others? In fact, I would argue that I am pretty damn good at engaging. Most people say I talk too much! Well, I stopped talking on social media and started talking a lot more in real life situations. This is what changed my business forever. Each time I walk on the golf course I have the opportunity to build a new business relationship. No way in hell am I going to ruin that chance by walking up to my playing companion and saying, “Hey, I have a great seven part series you should read to help improve your driver swing.” He would look at me, laugh, and carry on. We would have a terrible round of golf and I would have lost an opportunity to build a relationship with a friend and/or a business partner. Over the last year I have posted very little, if any, non business related topics on Google Plus. I have no interest in learning ways to engage properly. I believe Google is a fantastic product that offers businesses a chance to increase their exposure but I do not think Google Plus will ever be a way to socialize or interact with normal human beings. I can do that in a public setting such as a restaurant, shopping mall, book store or my country club. The next time I walk up to the first tee I will smirk thinking about all those that would offer their opinion when it is not warranted. I, on the other hand, will use my over the top swing to post another 82 while creating a fantastic relationships.